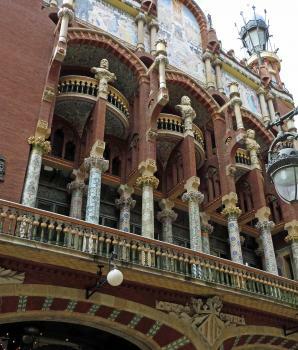 The Palau de la Música Catalana and the Hospital de Sant Pau, Barcelona were designed by the Catalan architect Lluís Domènech i Montaner, and are considered masterpieces of the Art Nouveau. Domènech also played an important role in the Catalan movement. 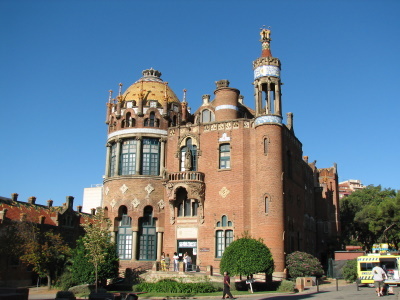 The Hospital de la Santa Creu i Sant Pau was constructed between 1901-1912, and the Palau de la Música Catalana dates from 1905-1908. A working hospital could easily be the most impressive architectural sight in Barcelona. We stayed in a hotel just around the corner (Medium Medicis, well recommended), and that way observed the coming and going at the hospital every morning. Ambulances with their sirenes turned on speeding past, or nurses and doctors dropping in on one of the cafés to buy some delicious fresh bread. Despite all this bustle, you are free to walk in the grounds. The hospital covers a large area and consists of several pavillions (27), all with their own characteristics. It was designed in such a way that the patients could stay in pleasant surroundings so they would feel better. The Palau de la Música Catalana, located in Barcelona's city center and hidden behind a glass front, is also very worth while to visit. You can only get in via one of the guided tours, which are conducted frequently. First a video is shown about the origins of the Palau, founded by the Orfeo Catalan (choir society). Then you are taken via the grand stairs to the main theatre. Sculptures represent the popular and classical music that is played here. A large stained glass object in the ceiling symbolizes the sun. Sometimes when you travel with family or friends, you are limited in the amount of time you can spend visiting World Heritage Sites; accordingly, my visits to the Palau de la Música Catalana and the Hospital de Sant Pau in May of 2013 were quite literally superficial. In some ways, I didn't mind, since I rather prefer Art Deco-style architecture to Art Nouveau, but I would have liked to have seen the insides of both buildings, which were designed by local architect Lluís Domènech i Montaner in the early 20th century. When I visited the hospital, a large crane was in front of the building, so we didn't spend much time there beyond taking photos. I was able to visit the Palau twice during my time in Barcelona, but was unable to take a tour because we arrived at the wrong time of day (which didn't particularly bother my friend who was by this time very tired of visiting museums or buildings). I appreciated the outside of the Palau, with its distinctive columns, mosaics, and tilework; however, it is very hard to photograph because of all the surrounding buildings. One day I'll have to return to see the inside, which looks fascinating in photos. Logistics: Both sites are accessible by Barcelona's Metro system. 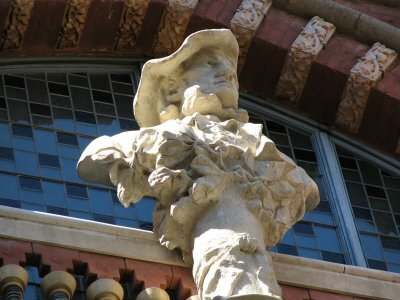 The Palau de la Música Catalana can be reached via the Urquinaona stop on Lines 1 and 4; the Hospital de Sant Pau can be reached via the Sant Pau/Dos de Maig stop on Line 5 or the Guinardó/Hospital de Sant Pau stop on Line 4. My trip to Barcelona in March 2015 was initially sparked by a desire to attend an artichoke festival. That turned out to be disappointment, but the trip was made worthwhile by the gem that is this Art Nouveau WHS. Whilst the tour was great, clearly the best time to visit the wonderful music hall for a performance must be a matinee, when you can benefit from the vast amount of natural light that floods into the hall through the side and rear windows and of course the magnificent skylight, nicknamed ‘the Glowworm’. A short metro ride away is the Hospital. We accidentally went into a modern working hospital before being directed round the corner to the Modernist original. It has the feel of a small city, consisting of something like 27 separate buildings, connected by underground service tunnels. 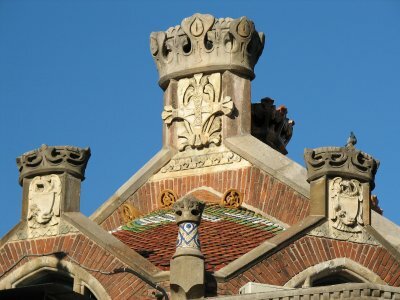 These two monuments of the Catalan Modernisme by Lluís Domènech i Montaner are at least as impressive and spectacular as the works of his more famous contemporary Antoni Gaudi. The magnificence of the sites are adequately described by the previous reviews. So just a few recent information that might be of interest for future visitors. 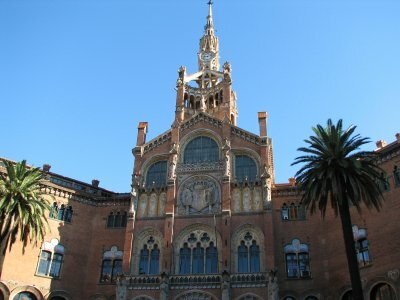 The historic buildings of the Hospital de Sant Pau are no longer in use as a hospital (since 2009). On our visit in May 2014, the renovation was almost complete. The central area of the complex can be visited either with a guided tour (14 Euro) or self-guided (8 Euro). This zone comprises the most fascinating buildings: the administration building, eight large and two small pavilions, and the central pavilion (the former surgery building). Three pavilions are open to visitors: the administration building with the amazing main hall, a small pavilion (Sant Jordi) with an exhibition about the restoration, and the Sant Rafael pavilion whose interior has been restored in the original design, so that you get an impression how it would have been as a patient here. All other pavilions are or will in the future be used as offices for academic institutions. The buildings outside the museum area houses facilities of the new hospital and the university and are not accessible. These buildings were completed after Montaner's death by his son Pere Domènech i Roura. Unfortunately the church was closed for renovations and there were still some building site fences in the outer areas. So perhaps the visitor area will be extended in the future. 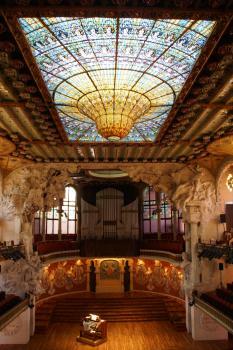 The Palau de la Musica Catalana is a masterpiece of the Catalan Modernisme. You should not be deterred by the steep fee for the guided tour (18 Euro), a visit is worthwhile. The tour starts with a video, then you'll see the beautiful vestibule and the staircase, and finally the main concert hall. All is sumptuously decorated with ceramic mosaics, stained glass, and sculptures. The highlight is undoubtedly the stained-glass skylight (photo) in the shape of an inverted dome. And in contrast to previous reviews: we were allowed to take photos everywhere inside the building. The guided visit to the Palau de la Música Catalana is well worth the entry fee (in my opinion better value for money compared to some of the Gaudí buildings). A very interesting film covers the history of the building and of the Eixample district. You will then have enough time to enjoy the amazing interior of the concert hall with its stained-glass skylight. 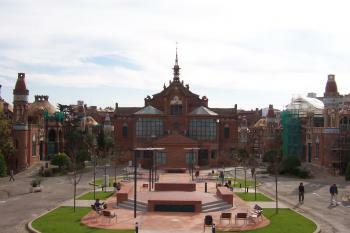 The Hospital de Sant Pau is also a great place to discover. I visited this WHS in November 2007. These Art Nouveau buildings in Barcelona blend in pretty well with the other buildings of the city. The highlight of my visit was the Pau Hospital steel-framed structure with the 'clock tower'. I can only second the glowing reviews posted here. In what is a great city to begin with, these two buildings by the Catalan Art Nouveau architect Lluís Domènech i Montaner stand out even by Barcelona´s very high architectural standards. The hospital is probably like no other in the world (and the only one I´ve ever come across that is mentioned in a guidebook), and even though a new hospital is currently being built, it´s still a working place with real patients inside; it´s within easy walking distance of the Sagrada Familia. The Palau de la Música Catalana, located close to the Cathedral in the Barrio Gótico, is not terribly impressive from the outside, but the inside, especially the auditourium, is just fantastic. Even if you´re not really into classical music, it´s well worth the long wait in line to get tickets for a guided tour (if English is sold out, you could still try Spanish or Catalan, even if you don´t understand it, since the important thing is to SEE the inside!). Two of the finest buildings I have ever seen, and a must when coming to Barcelona. The Palau certainly has a nice facade, and is apparently a great place to see a concert (unfortunately I didn't get to see one). The Hospital though is excellent. Clearly an architects folly, that paradoxically has a genuine use. The buildings are beautiful and in great condition. What's more, it's free to walk around the grounds. It is well worth a visit if you're in the area. The two buildings on here are quite a way apart from each other in Barcelona but can both be seen easily if you want to spend a couple of hours touring this fantastic cities main sites. The Hospital San Pau is very impressive and just up the road from Gaudi’s famous Sagrada Familia so makes a great reason to travel up to see it. The decoration is fantastic and it seems hard to believe that this is still a functioning hospital as the level of design that has gone into it is immense. The Palau de la Musica Catalana has an impressive façade that is hard to take in due to the tight nature of the Barri Gothic area, if you can get inside though it is massively impressive. The tour costs €8 and includes a video introduction but nothing can compete with the main auditorium which is absolutely stunning. The place seems to just ooze music knowledge and again the craftsmanship is apparelled, and the stained glass roof was perhaps the highlight of the whole city for me it is just a staggering piece of work and the only time I have seen 3-D stained glass worth the admission price in itself. There is only one problem and that is you are not allowed to take any photos inside! The Palau de la Musica is an amazing building. Guided tours are offered on a daily basis, but the best option is to try and get tickets to a concert during your stay in Barcelona. The Palau is easy to find, just off Via Laietana, (nearest Metro: Urquiniona) and a short walk from the Cathedral. Hospital Sant Pau is an excellent example of modernist architecture. It is free to enter the gardens, where you can observe the different buildings which are still in use. The nearest metro is on the blue line (Sant Pau), but I would recommend you combine this visit with one to the Gaudi cathedral (La Sagrada Familia). The two sites are close. You can walk from one to the other along Avenida Gaudi in less than 10 minutes. Unfinished constructions: The original plans to paint the walls was never realized as by the end of construction a style shift occurred and the lavish decoration of the Palau was no longer in mode. 321 Community Members have visited.